Make this easy traditional crockpot stuffing recipe in your slow cooker to help save time and work on Thanksgiving day. There's no better way to make this classic recipe without the muss and fuss of stuffing the turkey and having to dig out the stuffing before you carve the bird. 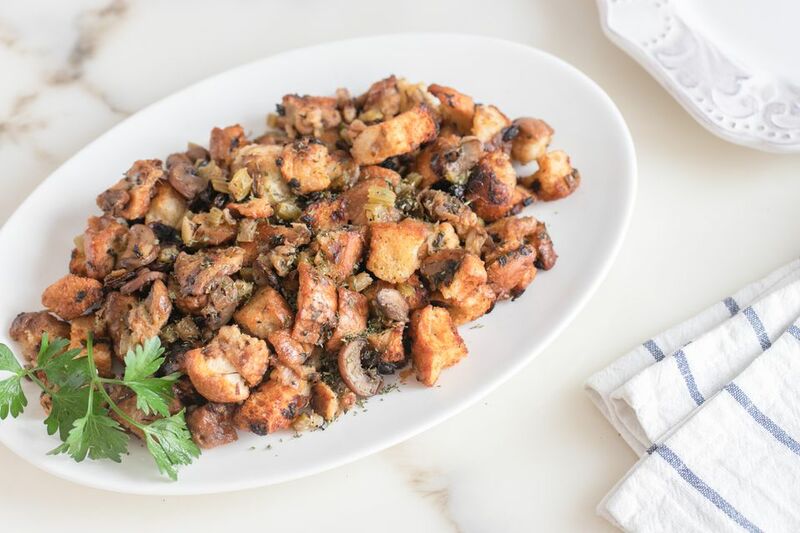 This is a mild stuffing, flavored the classic way with poultry seasoning and sage. You could change the herbs if you'd like or add more vegetables. This recipe is an excellent way to make more stuffing without having to take up space in the oven. You can use part of this recipe to stuff the turkey, though. Just fill the neck area and cavity with stuffing (don't pack it in) and roast the bird until a food thermometer put into a thigh and into the stuffing registers 170 F. Any leftover stuffing can be made in a smaller crockpot, or you can bake it in the oven for the last hour that the turkey is roasting. To dry the bread, let it stand uncovered overnight on a wire rack, or bake in a 200 F oven for about 20 to 30 minutes, until it's firm, then cut it into cubes and continue with the recipe. In a heavy skillet, melt the butter over low heat. Add the onion, celery, parsley, and mushrooms and cook, stirring for 2 to 3 minutes, or until the vegetables are crisp-tender. Meanwhile, place the bread cubes in a large bowl. Pour the onion mixture over the bread cubes, then add all of the seasonings and toss well. Pour enough broth into the stuffing to moisten it, about 1/3 cup at a time, tossing with fork. Don't make the dressing too wet, because moisture doesn't evaporate in the slow cooker (or in the turkey!). Spoon the stuffing lightly into a 5- to 6-quart slow cooker. Cover and cook on low for 6 to 8 hours, sprinkling with some more chicken stock once or twice during the cooking time.